How do I open a vintage Word 3.0 - 5.0 *.txt file in an up-to-date word processor (i.e. OpenOffice) and convert it into a *.pdf file for archiving purposes? Bad things first. It is not possible to import an old Word *.txt file directly into a modern text processor. Modern word processing systems (i.e. OpenOffice Apache 4.1.5 / macOS High Sierra) usually have import filters for text files from the Windows 16 bit (3.0 - 3.11) but no longer from the DOS era. For this reason a small detour via Windows 3.X and Word 6.0 for Windows must be inserted first. But this step only takes a few minutes! Write your text file with Word 5.5 (DOS) or open your old text file and see if everything is still fine. Save the file in the Word 5.5 DOS format (*.txt). Start Windows 3.0 and open (file convert) the *.txt file with Word 6.0 for Windows and see if everything is fine. I only changed the font to Courier 10cpi. Then save the file in the Word 6.0 *.doc format. Transfer your Word 6.0 *.doc text file into your new OS system (i.e. macOS High Sierra). For this purpose I use my home FTP-Server, it works perfectly; no sneaker/floppy network needed! 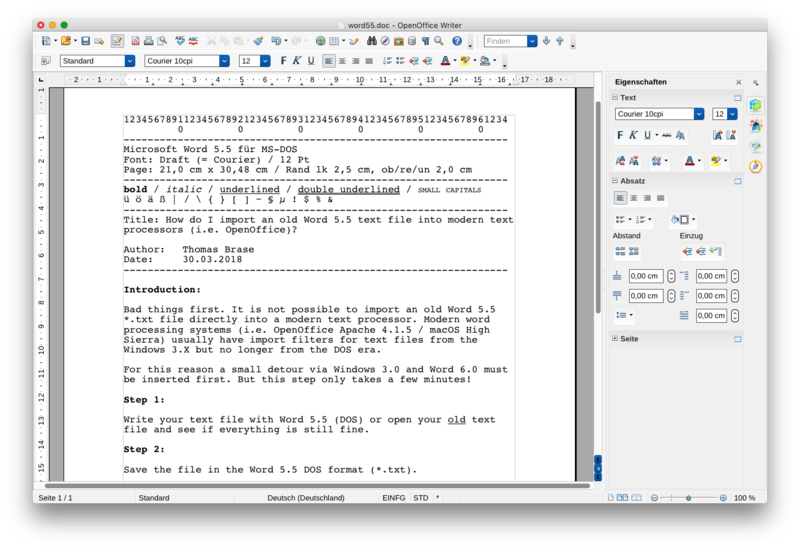 Open/import your Word 6.0 *.doc file in your favourite text processing system, i.e. OpenOffice Apache 4.15. That's all. Export/save the file into a PDF/A file. Done. There were two Microsoft converters, but they are no longer available on the official sites. They are: WDSUPCNV.EXE and WRD97CNV.EXE. Both programs are of course still available on the internet. Just search! "In fact, Microsoft does not provide import filters for Word 97 files from older word processors, not even for your own Word for DOS. However, a package with additional filters is available for free download on Microsoft's web server. Besides import filters for the DOS versions of Word (4.x, 5.x and 6.x) it also contains converters for WordStar from version 3.3 and Ami Pro 3.x. To find it on the web server, click on Microsoft's homepage http://www.microsoft.com on the search function and enter the file name Wrd97cnv.exe as the search term. A list with hyperlinks to the download area will then appear. (db) The file containing the import filters for older Word versions is called wdsupcnv.exe and can be downloaded from Microsoft's ftp server (ftp://ftp.microsoft.com) in the /Softlib/MSLFILES directory." By the way, you can of course transfer old Wordstar 3.30 text files to a modern PC in the same way. The basic procedure is the same. For example, I created a file under CP/M-86 on the IBM PC and was able to open it in macOS High Sierra with OpenOffice 4.1.5 and export it to a *.pdf file.